I got this eyeshadow palette last year..I decide to make a review for this eyshadow palette.. Inside it has a mirror on the lid and has duo felt eyeshadow applicator.. This come the transparent sheet that cover the eyeshadow pan and have names on to describe the colour code. The swatches for eye colour according to the eyeshadow palette position..
As stated this eyeshadow colour all matte and it comes with 12 various type of colourful colour! Usually when it come with matte eyeshadow people will think that it tend to be chalky finish but this eyeshadow not like that.this is a mineral-based eyeshadow..it is smooth and suitable for creating multi-dimensional eye looks...The pigmentation of the colour are different because certain colour might suitable for your skin tone but some might not suitable..It depends..For best result apply eye primer..This eyeshadow suitable for those who love for experiment..It has a very bold and bright colour for eyeshadow..Since this is all matte finish it will be good if you apply your eyeshadow primer..This eyeshadow texture a really smooth..easy for you to apply and blends well..the colour is totally pay off.. 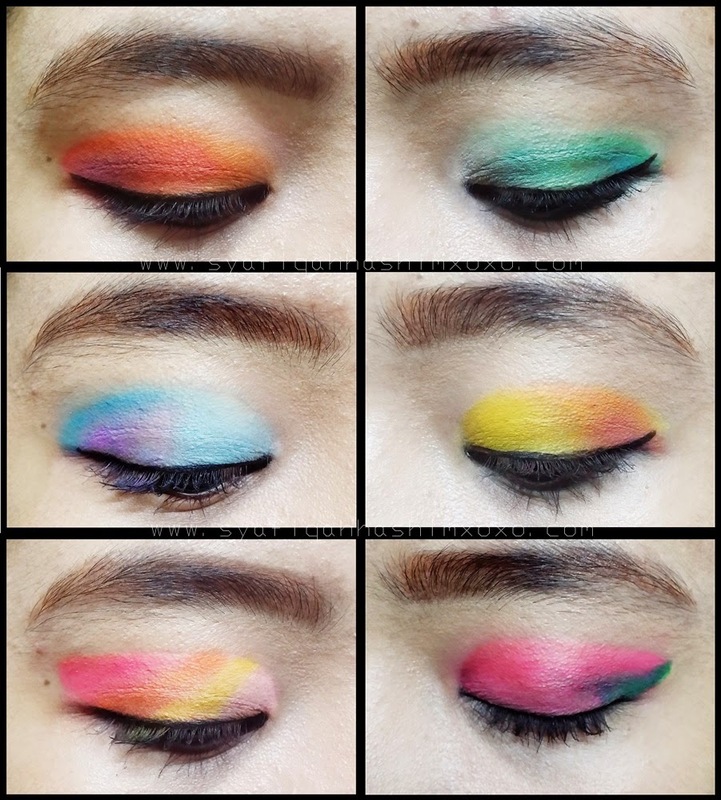 This is what I do when I tend to get bored and I love to experiment and try out my beauty products..pardon my serabut eyebrows..hehehee..ohh yahh..if you want the colour be bold and stay put dont forget to apply primer.. This is my second Sleek Eyeshadow palette that I have..I totally love Sleek eyeshadow and would like to recommended this for beginners..This also suitable for someone who looking for a good quality eyeshadow yet affordable to have..Sleek i-Divine Eyeshadows Palette have various types..go check out my review about Sleek i-Divine Eyeshadow Palette in SUNSET...Hope you like my review..
yey...cantik lah kombinasi kaler tu. serius.